When you buy your spices, you might be getting more seasoning than you might expect. Why not get some free tiny fragments of insects, dirt or animal feces to go with your chilly? According to the Food and Drug Administration spices entering the U.S. are nearly twice as likely as the average FDA-regulated foodstuff to contain Salmonella pathogens or unacceptable amounts of filth. The FDA cites that roughly 12% of US spice imports exceed the “maximum levels of natural or unavoidable defects,” such as insect body parts and animal hair. FDA’s study identified 14 outbreaks involving spices from 1973 to 2010 that resulted in 2,000 people reporting illnesses worldwide. The number of outbreaks may be low because people use small amounts of spices on food or cook the seasonings before eating, as well as safety measures taken by the industry, the agency said. The maximum level of such unavoidable defects can be translated to roughly 170 insect fragments or 25 rodent hairs for a two-ounce jar of paprika, for instance. Anything below that is deemed acceptable by the FDA – in other words, all spices contain considerable filth. 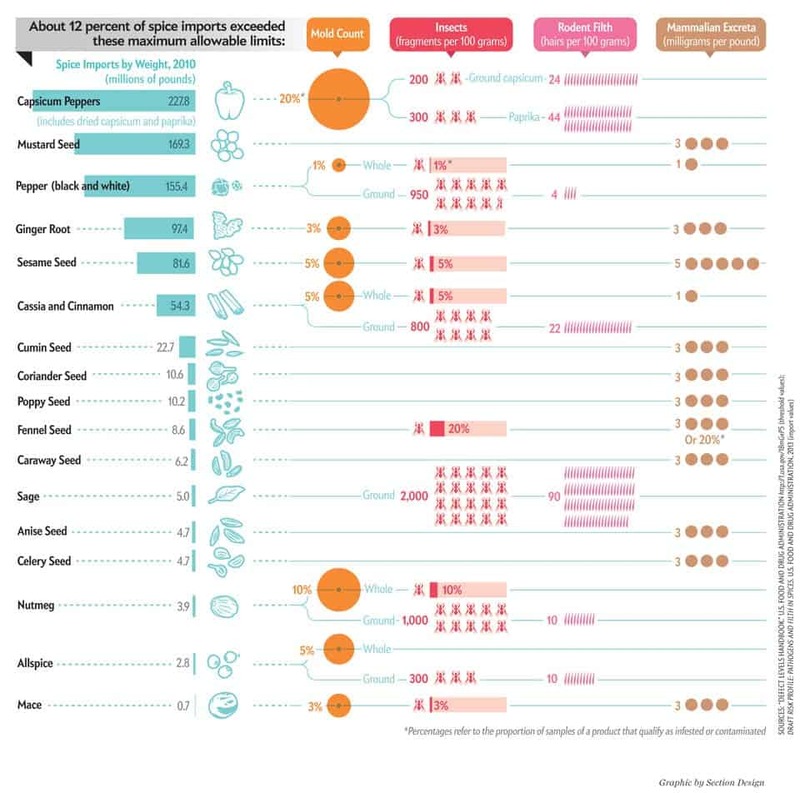 The infographic below does a good job of summarizing what you’ll find in your spice jar on average for various types of spice. If you can’t see egregious filth, it’s because it’s cloaked as fragments.